640 pages | 142 B/W Illus. Preface. Foreword. Chronic Respiratory Failure. Principles of Positive Pressure Mechanical Ventilatory Support. Chronic Respiratory Failure As A Global Issue. The difficult to wean patient in the ICU setting. Causes of difficult weaning: Which mechanisms are associated with long-term ventilator dependence? Size of the Problem, What Constitutes Prolonged Mechanical Ventilation, Natural History, Epidemiology. Weaning protocols - including NIV. Weaning Units - The U.S. Perspective. Weaning in a Specialized Facility. Rehabilitation in the intensive care unit. Organization Of Rehabilitaiton In The ICU. Indications and Physiological Basis of Rehabilitation in the ICU. Peripheral and respiratory muscle training. Innovative Approaches in Muscle Training: Transcutaneous Electrical Muscle Stimulation. Psychological Aspects and Interventions in Patients with Chronic Respiratory Failure. Chronic Ventilatory Assistance In the hospital (non ICU). Definition and indications. Clinical Settings For Ventilator-Assisted Individuals - When And Why - LTAC-SNF-CAVC. The Multidisciplinary Team-Training and Experience. Clinical Experience in CAVC Unit. Long term mechanical ventilation in the community. Indications, Definitions, Guidelines and Outcomes in Restriction and Obstruction. Choice of Devices, Ventilators, Interfaces and Monitors. Training the Home Health Team. Sending the Ventilated Patient Home. Health-related Quality of Life. Mechanical Ventilation-Legal and Ethical Issues. Special Considerations. Pharmacological Treatment for Patients with Chronic Respiratory Failure. Patient-Ventilator Interfaces for Invasive and Noninvasive Ventilation. Tracheostomy Weaning from Longer Term Ventilation. Communication Alternatives. Diaphragmatic Pacing in Chronic Respiratory Failure. Secretion Management. The Importance of Overnight Monitoring in the Management of Chronic Respiratory Failure. Management of Respiratory Infections. Nutrition in the ICU. Skin Integrity, Bowel and Bladder Care. Palliative Care For The Ventilator Patient End Of Life Issues And Approaches. Chronic Respiratory Failure in Different Patient Groups (Elective or Post ICU). Management of Chronic Respiratory Failure and obesity. Progressive Neuromuscular and Degenerative Diseases. 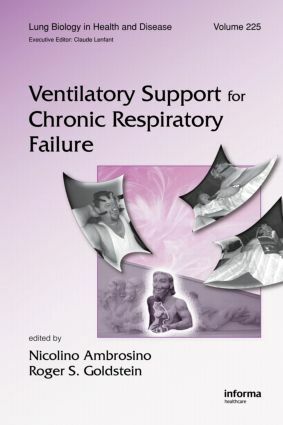 Chronic Ventilatory Support in Obstructive Lung Disease. Ventilation Among the Pediatric Population. Perspectives on Long Term Ventilation. The Perspective of Patients. The Perspective of Family Caregivers. The Perspective of Physicians (Intensive Care Specialist - Respiratory Specialist - Family Physician). Perspective of the Allied Health Professionals. Worlwide Approaches to Long Term Ventilation. The North American Perspective on Long-Term Mechanical Ventilation. The European Perspective. The South American Perspective. Long-Term Ventilation in Japan. NICOLINO AMBROSINO is Director of Respiratory Unit, Cardio-Thoracic Department, University Hospital of Pisa, Italy, Director of Pulmonary Rehabilitation and Weaning Center, Volterra, Italy and is or was Professor at the Universities of Pisa, Pavia, Florence, and Trieste, Italy. Professor Ambrosino’s research and clinical activity has been devoted to Respiratory Critical Care, Pulmonary Rehabilitation and Home Respiratory Care. He contributed to the development of the use of non-invasive mechanical ventilation techniques in acute and chronic respiratory failure, with several clinical trials and original experimental studies. Results of his studies have been published in more than 155 peer reviewed international journals. The former Head of Pulmonary Rehabilitation Working Group of the European Respiratory Society (ERS), Dr. Ambrosino is member of various editorial boards of several international journals, written over 60 books and chapters, 200 articles, and has spoken at over 100 international conferences. ROGER GOLDSTEIN is a Professor of Medicine and Physical Therapy at the University of Toronto, where he holds the NSA Chair in Respiratory Rehabilitation Research. Dr. Goldstein received his medical degree from the Victoria University of Manchester, UK. His research interests centre on the rehabilitation of patients with chronic respiratory conditions. The Divisional Program in Respiratory Rehabilitation at West Park Healthcare Centre is an academic clinical, teaching and research unit where subspecialty trainees in respiratory medicine from Canada and overseas, learn about rehabilitation and chronic ventilation. Recently appointed as the provincial centre of excellence in long term ventilation, there are over 300 ventilator-assisted individuals linked to this unit, the vast majority living in the community. The Centre also serves as a location for ventilation home training and reassessment. Dr. Goldstein is internationally known for his research on chronic respiratory conditions and has published in many peer-reviewed journals, making him a popular speaker and regular presenter at international conferences.